I think every kid likes to “cook” and this kitchen is adorable! At this price it's still a splurge, but maybe you have some Amazon gift cards from Swagbucks to help ease up on the price? 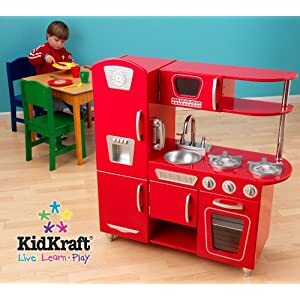 The KidKraft Red Retro kitchen is $110 on Amazon right now. That's 39% off the list price of $181. 2-day shipping is free if you're an Amazon Mom (sign up here for free! ), or Super Saver Shipping is free if you don't want to sign up.